God bless you for your defense of what is right. Yourreward in heaven will be great for your ability to persevere in the true faith. You are one of the most courageous men I know, and I am proud to have met you. Thanks for this very moving post. Gloria TV reports - (07 December 2017) Dictator Pope - "Vatican Funded Clinton’s Presidential Campaign"
"Libero Milone resigned as the Vatican's Auditor General because he was trying to make transparent ambiguous money-maneuvers, through which around one million Dollars from Peter’s Pence were allegedly donated to Hillary Clinton’s pro-abortion and pro-gay electoral campaign according to Piero Laporta on La Verità (July 4). Such rumours have been circulating since February 2016." I do not plan to read the book. I have a pretty good idea of how things are: corruption and sin and more that are reigning in the Vatican. My job as a little lay person is to pray and hope my heart does not become too bitter about the sacking of the Church. But it is confusing because it was always safest to stay in the camp of the pope and now it does not seem so. Are many things always called sin no longer that? If Our Lord said that to hear the pope was to hear Him, what shall we do and how do we justify to others living in sin that they are not on the right path? While we know what means a significant number of the wolves in sheep's clothing, we must also keep in mind that such are not since yesterday, neither since anno 2013, even not since the 60's. But before that. And then, with good understanding of that, then we can say, that those false spirit with its very poisonous smoke, because of its subsist for such a long time, has done so much harm to many. And with saying many, I must add too, - more than one or two generations. What we have right now, especially in the last 5 years, is just a culmination of that not so short process. The thing is, many of 'ordinary people' could not have possibly even imagine 5% of all of that, let alone a big(ger) picture. Therefore, many of them, who begin to see right now 'something' very wrong, are (desperately) thinking that all the problems would probably and hopefully be solved by changing one, or maybe a few high positioned persons in question (of course, in a regular and legitimately way only, according the well known laws, procedures etc...). But the truth is; the apostasy is so big, so grave, so world-wide, and it lasts for so long already, that we all should take special care of the amount of oil in our lamps. Sobering post, Fr. Blake. Well done. Be sure to "check 6" every now and again. God bless you and happy Advent. Father Blake, you nailed it. Thank you very much for your insight. God bless you. Are these troubles not a consequence of the Roman ecclesiology? You can take logs and build a ship with them - the Barque of Peter, or they can be tied together loosely and made into a sort of raft. Which is the more resilient? This is a memorable paragraph Father, one to be learnt by heart and remembered by all. Practically every vice, at his age? I haven’t read the book and don’t feel I need to. Very little that is new is reportedly in it, merely collating all that we already knew into one place – for anyone who was not paying attention. What this papacy is showing is what is, and what is not, the Church’s Magisterium – mainly the latter. Unfortunately this papacy can be detrimental to the salvation of souls – for which the current Pope and his enablers bear full responsibility. Our Lord was not dictatorial. He was stern, yes - but also forgiving. But He did not water down His teaching. Those who do – even Popes and Cardinals – are not His true followers. We owe them no allegiance. They have condemned themselves. Fr, if every member of the congregation at you next Sunday Mass have all read and understood your thoughts on 'Dictator Pope' prepare yourself. The congregation will rush the Altar at the end of Mass and carry you off shoulder high shouting 'We have a priest, we have a priest'. Talking about replacing the actual revealed words of Jesus? Here is how words of Jesus Christ said to sister Faustina have been changed on official webpage of Sanctuary of Divine Mercy in Krakow. Just run a translator of the Polish site (first link below) and compare with English (second link). Take a look at Day 5 where Jesus says "Today bring to Me the souls of heretics and schismatics...". In Polish it no longer mentions heretics and schismatics. Instead it says "Today bring to Me the souls of DISUNITED BROTHERS"
Simon, fortunately only a few read this blog. Tom, Don't compare "private revelation" no matter how popular, with the public revelation of Sacred Scripture and Sacred Tradition, it is like comparing jewels and dust. The only value such revelations have is that they echo or comment on the actual words of God. Such visions or private revelations have no more status than the writings or ptraching of any saint, certainly far less than any Papal Magisterial statement. And how he wants to change the words to The Lord's Prayer. Because it seems that God is trying to 'lead us into temptation'. It seems like the wording is correct if it is applied to bergoglio's church. I have not read the book but one of the reports about it says that Pope Francis is following the ideas of Peron. This just confirms what his arch-admirer Austen Ivereigh told us some time ago. Very weird. He explains why our English translation is in error. He also explains that the Pope does not wish to change the Lord's Prayer as mentioned on Sky News but change the translation. The French Bishops issued the new translation last week and now it is 'Et ne nous laisse pas entrer en tentation.' It is the third or fourth alteration in the Pater Noster since I first learnt it in French as a teenager. Kudos, Fr. Blake. Bold and bracing. Well, the author of the "Dictator Pope" has been interviewed via email. Here is the link containing the translation. Is the author a female? One of the subtitles in the transcript "In the book, she tells a little-known story about Bergoglio's past. It's about a Jesuit, Father Kolvenbach . What is it about? How did you learn about this story?" On the other hand, it could be a red herring. 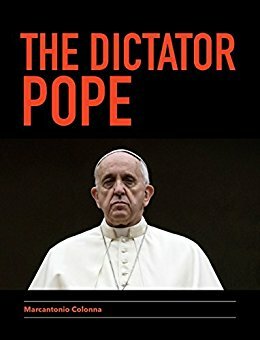 I have not read the book, but a reason why the reforms Francis to implement are not being followed through scandalizes me. "Because Pope Francis, who was elected to reform the Church, has discovered that he can control the curia more effectively through the corrupt figures that depend on him for power." "Perhaps it is that Catholicism in particular has seen so many changes in recent years that there are so few points of stability from which bearings can be taken." Grant, O Lord, that the Church may be seen as a rock once more, as Jesus intended, not as the morass that 'unjust and deceitful' men make Her out to be. Let's "cut to the chase" as they say, whoever "they" are. Which priesthood will you be defending before Almighty God and the Holy Apostles, Peter and Paul? What do you mean by "which priesthood will you be defending"? As a former parishioner of Fr Blake, I can vouch for the fact that he has given everything he has for the priesthood and the flock which he has been put in charge of. Fr Blake has nothing to fear, I would think. @David O'Neill - how should we distance ourselves from a Pope etc? The Catholic church goes beyond what is under the jurisdiction of the Pope in Rome. The Catholic faith can still be found preserved in its entirety. Physiocrat - but where outside of the traditional parishes celebrating the EF Mass can the Catholic Faith be found? Our problem after V2 (IMHO) was & is that the majority of Catholics were so 'obedient' that they followed where led regardless of the leader. The clue is in Fr Ray's Blog published on 11 December. He has pointed the way, discreetly as is appropriate in the circumstances. A priest is entrusted with the care of souls and does not have the freedom available to the laity.